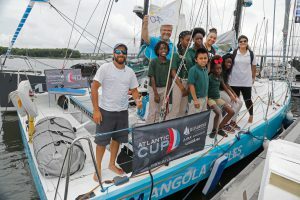 MAY 24, 2018 – CHARLESTON, SC – 540 children participated in Atlantic Cup Kids day today at Charleston City Marina. Atlantic Cup Kids is presented by 11th Hour Racing and is a program of the Atlantic Cup that teaches children about offshore racing and the environment. Students ranging in age from 9-12 representing area schools including Goodwin Elementary, Moultrie Middle School, St. Andrew’s of Math and Science spent two-hours at the Atlantic Cup base. Students rotated through stations that included knot-tying, a plankton and whale experiential learning station run by Sailors for the Sea, an alternative energy station where students got to see and feel solar panels and a Watt and Sea hydrogenerator. The final station included a boat tour on one of the Atlantic Cup competing boats.